Time to make room for the new paper! The Spring/Summer 2014 Idea Book from Close to my Heart is coming soon and I need to make room for some new papers which are AWESOME!! But to make room in my craft room for all the new papers and things, I have to use up some of the older ones I have! And I have a LOT of paper. My husband says I am a paper hoarder! Well, okay. Maybe a little. My problem is, when I have a paper I really like, I don't want to use it up! Yeah. I know. If you got to my page from Judy Faye Garner's blog, then you are on the right track, but if you find you are lost, just go back to the beginning at Joy McHargue's blog where the hopper list is posted. Remember this is a circular hop so no matter where you start, you can still see all of the projects. 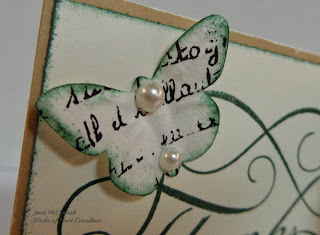 The Use Your Stash Blog Hop this month is all about using up the older papers and embellishments to make way for all the new items in the Spring/Summer 2014 Idea Book. I went looking through some of my old Workshops on the Go and found I had two Lucy kits from a few years ago. Time to use them up! 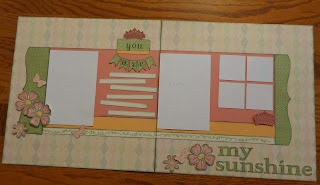 I made the layout and the Bonus Project and will be giving them to one of my nieces for her two little ones. I will be adding photos to the layout before I give it to her. I am so happy with how this layout turned out. I did a few of my own things but mostly followed the WOTG instructions. 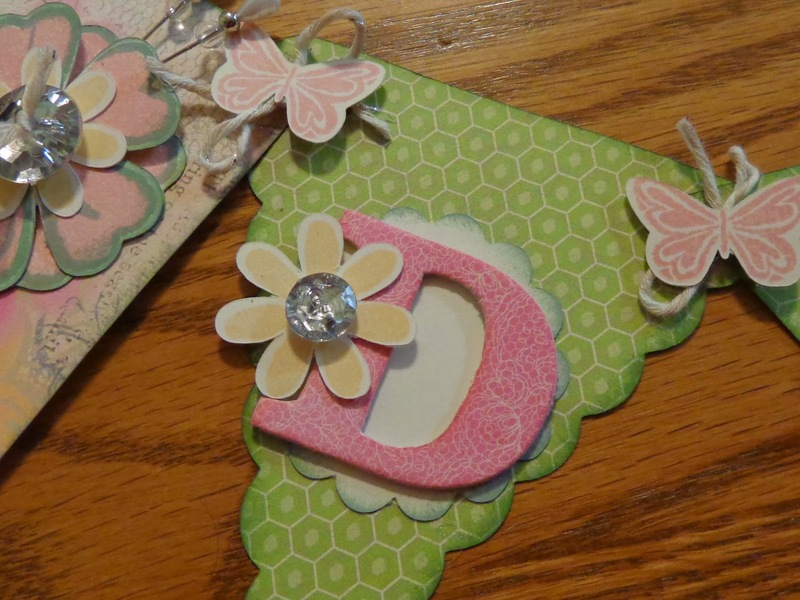 The alphabet used is Chocolate Small, and the letters, flowers, banner and butterflies were cut with my Cricut and the Art Philosophy cartridge. 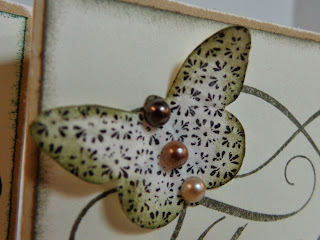 The flowers were first stamped with Slate ink and then with Blush ink. The butterflies were also stamped with Blush ink. The center of the flowers is stamped in Creme Brulee ink. I popped some of them up with foam tape to add some dimension too. The Bitty Sparkles on the flowers and butterflies are part of the Lucy WOTG. 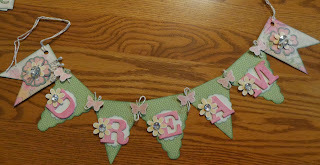 The Bonus Project is a banner using left overs from the layout. The banner pieces are all cut using the Cricut and the Art Philosophy cartridge. The letters are the chipboard letters that are retiring, covered with Lucy pink lacy paper and then finished with the Finishing Files, which are also being retired. 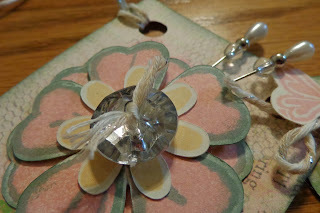 I didn't have the little flowers called for in the WOTG so I decided to use the large and small sparkly buttons with some of the Baker's Twine that came with the Sparkle and Shine kit. I also added two of the little pins that are retiring. A close up of one of the letters. Once they were covered and filed, I inked the edges with Blush ink. The banner pieces were all tied together with the same Baker's Twine and then the butterflies were hot glued on top of the bows. The buttons are also hot glued on. That's it for this month! I hope you like my projects. If you would like a Spring/Summer 2014 Idea Book so you can start your own paper crafting materials collection, please contact your local Close to my Heart Consultant! And before you leave, please leave a comment! Next on the hop is Shirley Ross so hop on over and see her latest artistic creation! It is always hard to say goodbye to good friends and that is no different when you have a favourite embellishment that is retiring. This month, our Cross Canada Blog Hop is dedicated to all of our retiring products, some of which are "go-to" pieces, and others we have never used. If you have come here from Carol's blog, you are on the right track, but if you get lost, just return to Michelle's blog in Nova Scotia where you will find the entire list of hoppers. Also, please leave your comments! We all love to get your feedback. 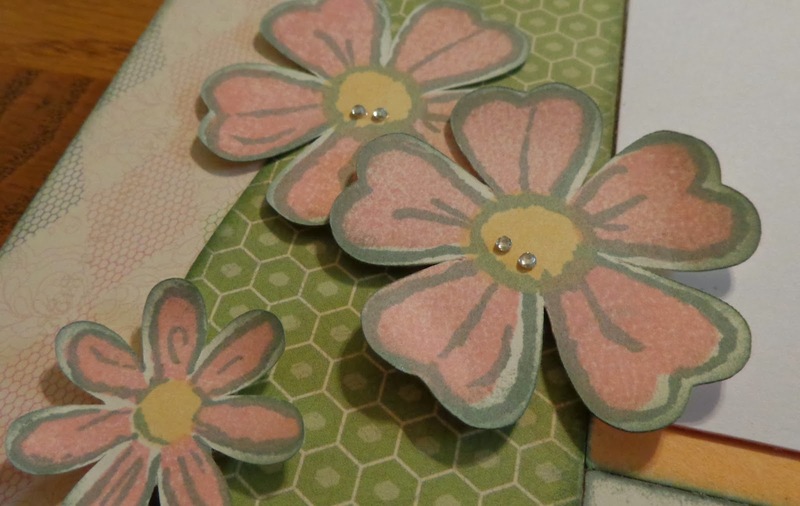 This month, I hemmed and hawed about what I was going to make and finally decided on a set of Thank You cards. 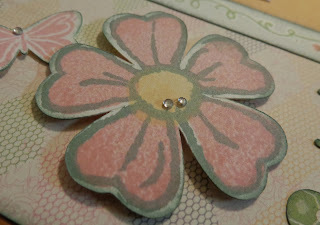 The base is Bamboo cardstock cut to 3" X 6" and folded in half to make 8 little 3" X 3" cards. 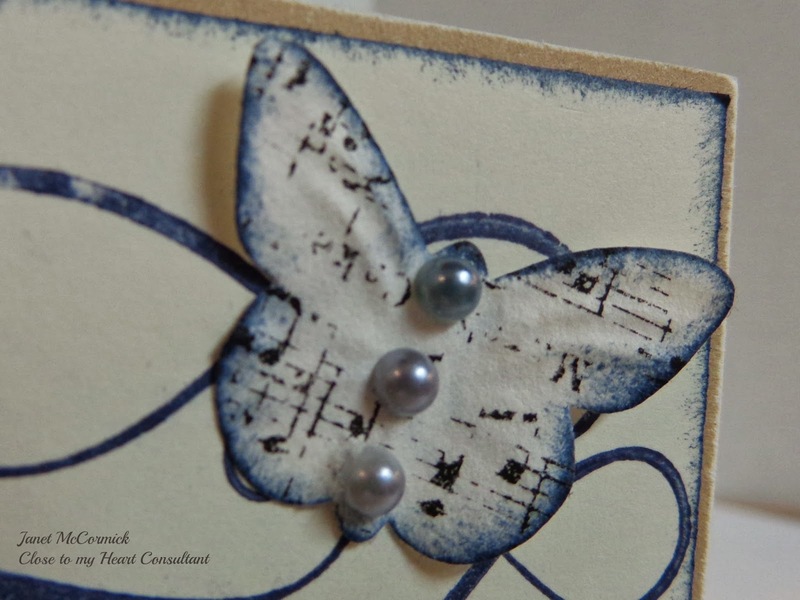 The Colonial White cardstock was cut at 2 7/8" to make a tiny border all around. 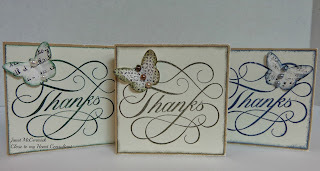 The retiring items I used are the Thanks stamp (A 1125), the Just Blooms Flutter Paper Shapes (Z1463), the Opaques Pearl Adhesive Gems (Z1336), and the Opaques Licorice Adhesive Gems (Z1335). This is a set of 8 cards, but I am only showing three cards here because the photo with all of them just didn't appeal to me. There are three in Cocoa dye ink, three in Ponderosa Pine dye ink and two in Outdoor Denim pigment ink (I didn't like the way it looked with the dye ink). I did distress the edges of the Colonial White and the butterfly with the dye ink though. 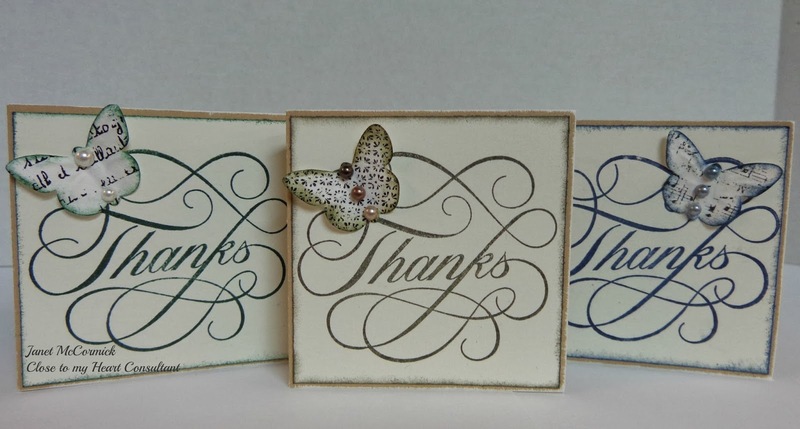 I distressed the edges of the Colonial White and the butterflies with the same colour the Thanks was stamped in, and then lightly sanded the edges of the card base. No, that is not Olive. That is Cocoa dye ink. It has a green base so unless it is stamped or sponged on heavily, it appears green. This one is stamped with Ponderosa Pine dye ink. I only have a few small white pearl gems so I only put two on these butterflies. Still looks good. That's it for this month! I hope you enjoy the rest of the hop, and remember that if you get lost along the way, just head on back to Nova Scotia and Michele for the list. And please leave a comment. It is always great to hear what you have to say about our work. So now head on over to Famida's blog to see her beautiful artwork! If you would like to purchase any of the retiring items in this month's hop, please visit my website at janmccormick.ctmh.com where you can shop from the comfort of your couch, or contact your local Close to my Heart Independent Consultant!